Hello Readers, and Happy New Year 2017! Unfortunately I was struck down with a cold on January 1st, and spent the first week of 2017 sick in bed. Luckily I'll get another go at new beginnings with the Lunar New Year at the end of January, so until then, I'm catching up on un-blogged projects that I was working on during December. And without further ado - my 2016 Year of Socks! This was a personal challenge that I set myself. Last January, I moved to Sweden for 5 months in order to do an Erasmus exchange with Stockholm University. I couldn't bring my library, my piano, my cello, or my sewing machine; but instead tucked in two balls of a luxurious mustard yellow sock yarn that I'd purchased at the first Edinburgh Yarn Festival back in 2013. I hadn't knit a pair of socks in about 7 years, and I wasn't sure if I still could. But socks are a small project, and I had space for this yarn amongst all the thermal underwear and woolly jumpers that I'd squashed into my suitcase. I cast on for these socks at the end of January 2016. They were knee high socks knit toe-up on 2.5mm needles. I swatched for them diligently, and it was my first toe-up project. I knit them on buses and subways in Stockholm; in cafes drinking endless cups of hot black coffee, and at the wonderful monthly knit night at Nordiska Museet (a Swedish folk traditions museum, kind of like Stockholm's equivalent to the V&A). They took a lot of patience, I got bored more than once - but once they were finished, I was officially hooked! I decided to challenge myself to see if I could knit a pair of socks per month during the rest of the year. In total I have made 10 pairs of socks, and I'm really happy with the results. 4 pairs are for myself and 6 pairs are for my partner. Some months (August and October) were entirely sock-less; other months (November) were furiously productive and I made more than one pair. I also have 1 orphan sock that I knit in December, but its partner was abandoned in the Christmas knitting rush. Together, my completed socks form a pleasingly colour-co-ordinated set, rather like a multipack you'd buy in a department store. I'm most drawn to neutral (ish) shades which can be easily combined with everyday clothing. I always use hard-wearing commercial sock yarn containing at least 20% nylon. Some socks have been more successful than others; but they have all been worn quite heavily - which really shows in the photos! My partner has taken to wearing his hand-knitted socks with great enthusiasm which is really pleasing for me - I love the fact that my hand-made gifts are being worn every day, and it makes me want to knit him more & more. In chronological order, here are the details of each pair of socks that I knit. My re-introduction to sock knitting wasn't faint-hearted: I went for a full-on pair of knee-highs! Read more about them here. Yarn: Old Maiden Aunt Superwash 4-ply (100% superwash merino wool), bought at Edinburgh Yarn Festival 2013 and hoarded for 3 years. Heel: slipped stitches to form columns, but this was my first sock in 7 years and I didn't get it right! Notes: This marvellously extravagant hand-painted yarn has turned out to be the worst choice for socks, and it has worn terribly. I adore the look of these socks, but after a few hours, they slip down annoyingly. I've taken to just wearing them around this house, which is a bit of a shame, but I can't face unravelling them! After the extravagant yellow knee-highs, I wanted something quick, simple and everyday for my next sock project. Notes: My first socks were a little on the roomy side, so here I tried to use negative ease to get a snugger fit. Unfortunately I went a bit too far in shortening the foot length, but they are still wearable. I also disliked the square Dutch heel that sits right underneath the foot, preferring a heel technique that clings to the contours of the heel. Surprisingly, the Regia yarn has fuzzed up a little. With these socks I was inspired by the small details inserted into cuffs, heels, and toes that were featured on historical socks from the archive at Nordiska Museet. I added a little garter lace insertion into the ribbing. Yarn: Hjertegarn 4 (75% wool, 25% nylon), a Danish yarn bought in Stockholm. Notes: this pattern, whilst pretty, is not very well-written. It features an extra-long gusset and no short-row shaping for the heel turn. The lace pattern also doesn't transform that cleverly from the foot into the leg. Here, I started experimenting with sock patterns, and combined the toe-up construction of my yellow socks, with the neat ribbed pattern of my rust socks. I made these for my partner. Burgundy is his absolute favourite colour, and it seemed strange that despite owning an example of every single type of clothing in burgundy (and/or associated colours of claret, maroon, plum etc) he had no burgundy socks! Notes: The yarn has pilled and fuzzed up a lot, and become rather matted in certain areas. Despite this, they've not developed any holes, although they have been heavily worn. Using the same pattern as above, I made these for my partner. He chose the yarn himself, and these are probably the most-worn socks out of the whole bunch. Yarn: Bergere de France Goomy 50 (75% wool, 25% nylon). Bought in London. Notes: The yarn has pilled a little, but overall the socks have worn very well. I'm not entirely happy with the bind-offs for a toe-up sock: they are either too tight or too slack, and don't match the elasticity of the rest of the fabric. A pair of everyday socks for my partner to wear at work. The pattern is barely discernible (especially on camera!) but in real life, the texture is very pleasing, even elegant. Yarn: Patons Diploma 4-ply (55% wool, 25% acrylic, 20% nylon). Bought in London. Notes: Black socks are hard to knit. I could only work on these in daylight, so they were quite slow-going. I was initially reluctant to use this yarn as it's such a high synthetic fibre content; but it was the only black sock-weight yarn stocked in John Lewis! The plus side is that they should be quite long-lasting. These socks took me ages to finish (probably because I knit a cardigan between the first and second sock...) They feature a scaled-down version of a typical Shetland horse shoe lace, which I always enjoy knitting. I'm not entirely happy with the bind-offs for a toe-up sock: they are either too tight or too slack, and don't match the elasticity of the rest of the fabric. After this point, I abandoned toe-up sock knitting for the time being. Notes: The yarn is a little heavier than many other sock yarns, so the socks are a bit thicker. I found it stiff and a bit scratchy to knit with, but this could be due to a tight gauge. These socks were an experiment in stash-busting. I was beginning to build up quite a pile of sock yarn leftovers, and I hate stashing, so I wanted to see how far I could get with just buying one ball of plain 'fresh' yarn. I think they make a fun casual pair of socks. I gave these to my partner for his birthday. Notes: As I was using leftovers, I didn't try to pattern-match the stripes on the contrast sections. These socks have become quite fuzzy with wear, but it's OK for a casual sock. At this point, I affirmed that my favourite socks to make, see and wear incorporate simple textured stitch patterns. I also love uncomplicated but striking uses of colour. I gave these socks to my partner for Christmas. Yarn: just over 1 ball of Drops Fabel sock yarn in blue (75% Wool, 25% Nylon), and leftovers of black yarn for the contrasting toe and cuff. Notes: Drops Fabel is a great yarn that's very cheap, however it gets fuzzy quite quickly. The subtlety of the diagonal purl pattern, and the beautiful eye of partridge heel, has become lost after a few weeks' wear. The last pair of 2016, and the first pair of 2017. I completed these on a day last week when I was still bedridden, but slightly more lucid. They haven't been worn yet, which is why they look so skinny and weird! The yarn was an absolute joy to knit with, but I am concerned that it won't be that hard-wearing. I originally made these socks for myself; but when I finished them and put them on, I let a out a big sigh...They were so much my partner's colour that it looked like they already belonged to him! I kept feeling like I'd stolen his socks, and couldn't wear them with a clear conscience. So I gave them to him for our anniversary at the beginning of January. Construction: twisted 1x1 rib cuff; heel flap/short row turn/gusset. Notes: I love them! The best fit I have achieved overall. I find the look of these 10 socks squashed into this wooden crate incredibly pleasing. It was much emptier once I separated my socks from my partner's, and it would be lovely to fill it up again over 2017; but I'm not going to set myself a challenge this year. Various family members have requested sweaters, and so I've decided to take the focus away from socks slightly. Recently, I have discovered similar sock-knitting initiatives linked to podcasting/Instagram, such as the Box O'Sox KAL which requires 12 pairs of socks in 12 months. I don't want to set myself up for failure, so I won't be taking part, but the hashtag is fun to follow anyway! That's not to say that I won't be knitting any socks! I have somehow acquired 4 new balls of sock yarn; there's an unfinished pair to complete; and there's some old stash yarn to use up too. So that's pointing to at least 7 pairs of socks in 2017. On that note, I'd better get knitting! Beautiful socks! I think the knee-highs are my favourite, just for your sheer audacity for choosing them for a first pair in so long, and perseverance in getting them done. 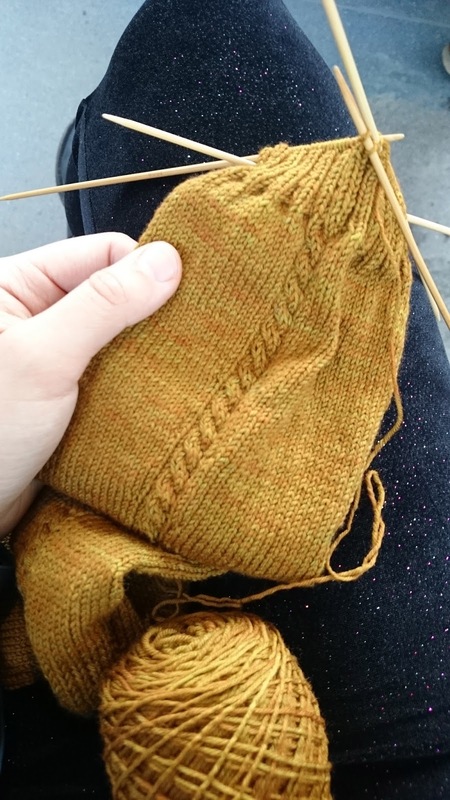 The best cast-off for toe-up socks for me is the grafted/sewn cast-off (if you're finishing off with k1p1 rib, at least) - fiddly but looks so professional and nice and stretchy.